New York: Penguin, 2013, c2000. This little fable, prettily illustrated by Nomoco, is a very quick read that seems straightforward on first view. 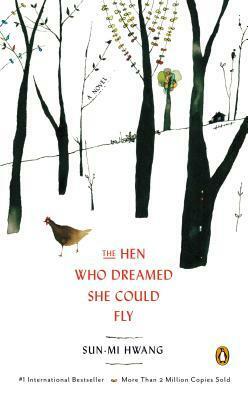 A laying hen, having named herself Sprout, finds a kind of freedom after surviving a cull of non-productive hens. She's outside of the coop, in the farmyard, as she's always dreamed. But the other animals - the rooster, hen and flock of ducks, alongside the guard dog, don't seem to want her there. She tries and tries to fit in, hovering at the edges of the farmyard society and taking the scraps of what's left. Until finally she realizes that this just isn't enough. She follows a wild duck from the barnyard out into the fields and there gains her heart's desire -- to hatch a chick. Unfortunately the chick is from an abandoned duck egg, and Sprout must raise this duckling on her own, with only her own love for it to guide her. All the metaphors of sacrificial motherhood as the highest calling are found here. Sprout protects Baby from the stalking of the wild Weasel and the mockery of the farmyard society which she briefly tries to return to. She gives up everything, she's hypervigilant, she subsumes her own brief life and hopes of freedom in her care for Baby. She raises him, allows him to strike out on his own with a flock of mallards who appear on the lake and finds the apotheosis of her sacrifice when he flies south with these ducks of his own kind. I'm sure there are many parallels to the acceptance of multiracial norms in Korea that I'm missing - perhaps a social bias about adoption - and certainly an attitude of maternal sainthood. While this book has been compared to animal stories as varied as Charlotte's Web to Animal Farm, I don't think there is a bigger message here other than that maternal relationship as the whole of life's meaning. It's a very short book, an easy read, with a definite fable-like tone. I do feel like I'm not grasping the full implications of her metaphors and references, perhaps because of my lack of familiarity with the social structure she's reflecting, and perhaps because the glorification of motherhood is not a theme I connect with at all. If anyone has read this and has another take on it, please share! It's still a charming book for the characterizations of all the different animals, and the realization that 'enemies' like the Weasel and Sprout herself have personhood in common (again, this comes via the maternal theme). Sprout's desire for freedom and her unquenchable independence did save the story from becoming only a maudlin paean to maternity. It's a lovely physical object as well, and the illustrations add an extra touch. Despite my reservations about elements of the theme, it's worth exploring. Yep, it doesn't seem like I have much fondness for animal stories overall, and so this one was meh.